Well, the food challenge is nearly over, and I have to say I'm feeling quite relieved. With just three days left (including today), I've had just about enough of being so concerned about our food budget! This week's tasks were to stop restricting food intake, make enough food to last us until Thanksgiving (but not too much), and to prepare a Thanksgiving feast while keeping within the budget. I made a few dishes early in the week for us to eat until Thanksgiving, including a big pan of gluten-free breakfast casserole, which featured many ingredients from the pantry and freezer. On Sunday, Jaymz made himself a pasta dish to take to work for lunch during the week. We didn't make quite enough food to last those first three days, but we ended up having soup and other frozen meals to fill in the gaps, so it worked out fine. Since it was just the three of us at the house for the long weekend, we decided to spread out the cooking and eating over several days instead of making everything all on one day. On Thanksgiving, we cooked a turkey breast (brined, then roasted), gravy, gluten-free bread stuffing, and mashed yams with cinnamon and brown sugar. The next day, we made turkey noodle soup made with fresh turkey stock, which we're still eating—I even had it for dinner last night! Yesterday, we made green bean casserole using some of my homemade cream of mushroom soup from the freezer, and tomorrow I'll make mashed potatoes to continue to eat with the soup (and to use up the gravy) over the next few days. The food restriction tendencies that I wrote about last week have been difficult to overcome. I continue to feel quite disturbed by how quickly Jaymz and I slipped into that habit, and how hard it's been for us to get out of it. Jaymz keeps asking me if it's OK to have a second helping at meals, and I keep reminding both of us that of course we should eat as much as we're hungry for. Thanksgiving groceries for this week came to $54.26. Partly because we're still trying to overcome the food restricting thing (and partly because the fridge was getting awfully empty) we made an extra trip to the store this week for eggs, milk and other staples for $11.14. The total food expenditure for the month was $213.53! Even though we went over my original $200 budget, I still feel like we did an incredible job of eating up the food we already had and sticking to such a small amount of money for food. I'm having mixed feelings as this challenge comes to a close. On one hand, I'm glad we did it because now we know it can be done. On the other hand, I'm wishing that it hadn't had any of the negative effects on us that it has. Looking back, I think I'm most glad that I've had more practice with menu planning this month. I'm enjoying making a list at the beginning of the week of all the things I intend to make that week, and getting to choose each day which one fits best with our schedule. It's definitely helping us to waste less food, and also to not just order take-out in the evenings because it gets too late to make something. (At that point, Jaymz and I are both too tired to brainstorm meal ideas, anyway.) I'm definitely going to continue this practice into future months. Another thing I'd like to keep doing as we continue this food budgeting journey is Cooking Day. We used to spend most of the day cooking every Sunday, but the practice got overlooked along the way and we stopped. I really enjoy being intentional about cooking a lot in one weekend day, as it makes the rest of the week much easier. This week I have biscuits (from homemade GF biscuit mix), roasted squash seeds, oatmeal, and acorn squash all ready to eat, as well as green bean casserole, turkey soup, and other Thanksgiving leftovers. Just like getting the laundry and other chores done on the weekend, it feels nice to me to start the week off with fewer items on my "To-Do" list. Moving forward, Jaymz and I have agreed to continue to be more intentional about meal planning and food budgeting. We're committed to using the foods we have instead of just stockpiling them, and cooking at home more often than not. We think that a $400/month food budget would be a more realistic target for our family's food spending, so that's what we'll shoot for during December and see how it goes. Overall I think it was a success, and I'm looking forward to how this new awareness of our food consuming and spending habits will affect other areas of our life and budget! I was inspired to start this challenge (in part) by Momma Jorje's Monday Minimalist series. I've been participating in Monday Minimalist during November, writing progress updates for my family's minimalist food challenge. 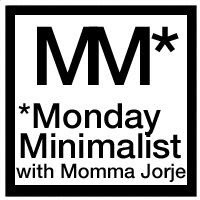 I hope you'll participate in Monday Minimalist with Momma Jorje—it's never too late to simplify your life. Head over to Momma Jorje and grab her brand new MM button! I think you did AWESOME! The idea of eating for the month for just barely over $200 is amazing. Perhaps in a month or in a few months you could update us on whether you're sticking to a cooking day and how your new habits are going with your food budget. Wow. I am crazy impressed that you stayed so close to a $200 budget even during a Holiday month. It's been interesting to read about this food challenge. Thanks for keeping us up to date! Good job! Our food budget is also $200, and it does make it difficult to eat what we want without restricting ourselves. And now that one of us is gluten-free, one of us is weaned, and one of us is pregnant, I'm not sure $200 is going to cut it anymore. Luckily with my husband's new job, I think we can afford a slight increase. It's been neat watching you do this! I need all the encouragement I can get to continue cooking completely from scratch and on a budget. Sometimes lately I've just had a hankering for pizza -- or, more accurately, for a night where I don't have to plan or cook anything -- and it's so hard to get up and go make something instead! We also have found great benefit from creating a weekly meal calendar! Keep it up. Wow. I am very impressed. After taking a look at our pantry - our family needs to do a version of this. Thank you for sharing! I just found this and read all through your minimalist food challenge days and I am so impressed with this. We live in Hawaii, where the cost of living is ridiculously high...a simple gallon of milk at a regular grocery store (my husband is in the military, so we shop at the commissary on post 99.9% of the time) costs close to $7, if not more. And that's just regular milk...nothing special or awesome about it. I cannot wait to get back to the mainland so instead of having a food budget of $600 a month (about $150/week) we can have a lower food budget.